Had a good full English and selected teams - off we were to Aggy. This was the fifth time in a row Perry had been to Aggy doing the exact same trip. I had Peter, Luke, Yuchi and Tilly on my team. After waiting for the other teams to get ahead we entered the dusty bat ridden cavern. Left, left, left that’s all the navigation required for the entrance series, easy enough! The going was good, stopping here and there for a cheeky group pic and a snack. Kenneth and I, a crack team, hundreds of meters of deliciously smooth rock. A recipe for success. The entrance is, as usual, an excellent introduction to caving. A few low crawls, tight smooth rifts, comatose insects covering the walls each more decayed than the last. Perry and Sam were long gone far ahead so we were left to navigate ourselves. Kenneth did an admirable job and we lost no time even through the first boulder choke and into the delightful crawl and climb section beyond, popping out into Barons chamber for a cheeky photo. Climbing on the way out is a team effort. A sign warns about 'taking nothing but photos and leaving nothing but footprints' to which someone has helpfully appended 'and signs'. We trecked down the main passage, everyone suitably awed. As we approached the turn off into the stream way we heard echoey ay-os behind us. Thinking it was Ben's group catching up we decided to wait with our lights off. As they rounded the corner Kenneth and I burst out with a chorus of "My Heart Will Go On". Dewey approached with Peter and the remains of his group. Tilly had sprained her ankle on one of the climbs so Ben had graciously offered to lead her out of the cave. With our new super group we dove down into the stream. We kept a reasonable pace and I think we reached Key Hole Chamber by the time we decided it was lunch/turn around time. Sandwiches are a very welcome thing even after some complaints whilst buttering the twenty fifth roll in the morning. Our way out was equally smooth. We took our time as once again we climbed towards the trees and open sky. Kenneth and I rolled through many rounds of "My Heart Will Go On" (the chorus only of course), "Northwest Passage" (the chorus only of course), and "On the surface once again" (the chorus plus random misplaced bits of the song we could remember) and we were soon out, everyone tired and happy. Sunday caving, best caving. My main partners in crime this time were Ben and Sam, keen to lead another trip into Aggy. 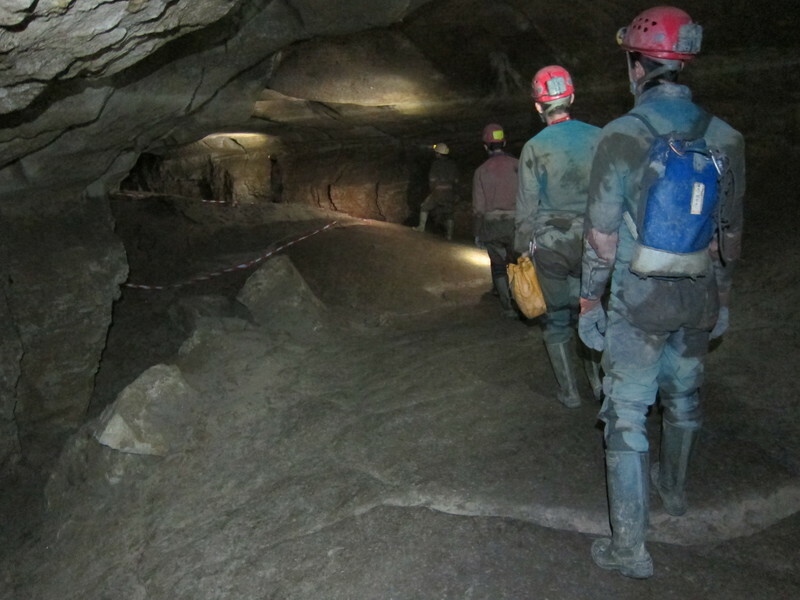 With everyone knowing the way and confident in newly acquired caving skills we stormed through to the main passage. I even had to open my oversuit and furry to keep cool (never sweat whilst caving). This time our target was the Music Room and the Cliffs of Dover at the far end of the main passage. We picked our way through the boulders, and then along the smooth fossil floors. I hadn't reached the Music Room the previous time I'd been in Aggy, always turning back as the main passage lowers. This time, under Ben's indefatigable lead, we braved the few metres of crawling to emerge in a low chamber. Ahead was the famed music stand complete with sheet music. Izzy turns out to be able to read music and to sing incredibly well. We sat and listened to her chilling rendition of whatever it was. Something about a grave? Unsatisfied with just Aggy we also paid a brief visit to Eggy. Interesting cave. A bit too full of spiders for my liking but from the sounds of it we didn't really see half of what it has to offer, merely finding 4 of the entrances and not venturing deep. We breifly lost Ryan and Shaun. They turned up in the entrance chamber. Unsatisfied with just Aggy and Eggy I wiggled my way into the two holes on the cliff on the way back that look like they should be caves. One gives a thrilling through trip of one body length to the other entrance where an exactly body sized tube leads of to unknown depths through muddy puddles and thousands of wood lice. I got a few metres in backwards before my feet touched something weird and moving and I quicky exited. Someone should go in head first and check it out, great lead.